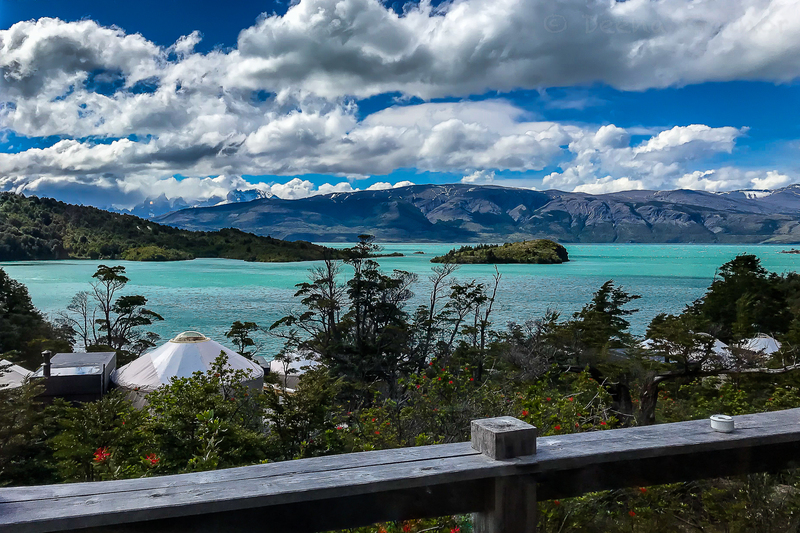 Patagonia Camp is a rustic, sustainable, eco-friendly camp dedicated to helping guests experience all that their beautiful surroundings have to offer. 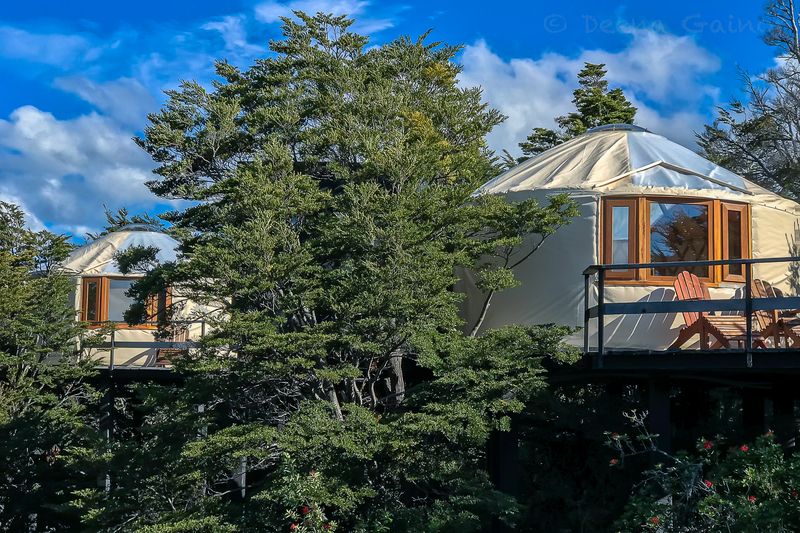 While there are definitely more luxurious options in the area, Patagonia Camp is unique in many different ways. For one, it is set on a lake and surrounded by beautiful forested land that you can hike through. Granted, most lodges are set in spectacular settings, but Patagonia Camp is on its own, which makes for a more intimate overall experience. Our first impressions. This is the view that greets you on arrival from the main lodge/restaurant area. The funny thing is, the clouds were covering the mountains, so you couldn’t see them in that moment, and yet the view was still stunning. Here’s what you see on a day that’s a little more clear. Check out the Lenticular Clouds! They were all over the sky that afternoon. Now, my beloved yurts. This is the reason we chose this camp above all the others. 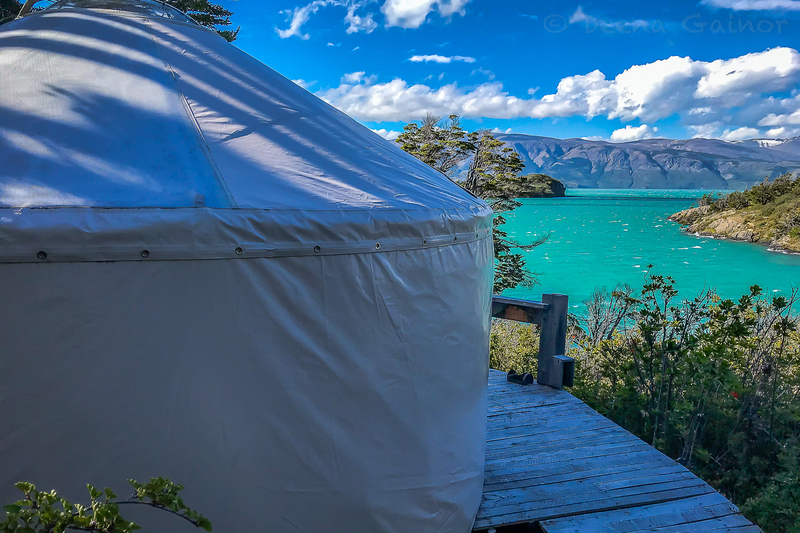 We really wanted to experience what it was like living in a yurt. Take a look at ours! Isn’t that an amazing setting? All the photos I am sharing with you have been taken with my iPhone 7 plus so what you see is what you get. And those colors!!! I especially love the views from the window. Here are a few more from the inside of our yurt, but first, I do have a confession to make. 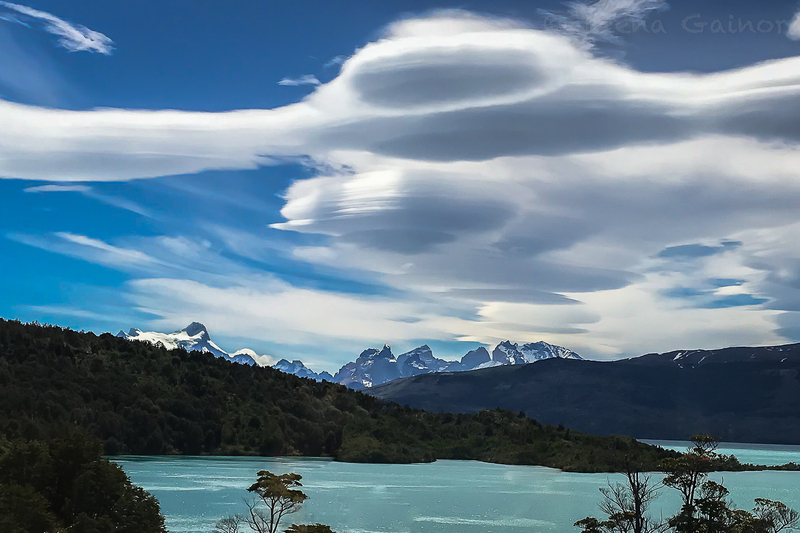 It can be super windy in Patagonia…like blow you away kind of windy. Do you remember this from my last post on Patagonia? I was a bit fearful our first few nights. The wind was ferocious and we could clearly hear it whipping around us. 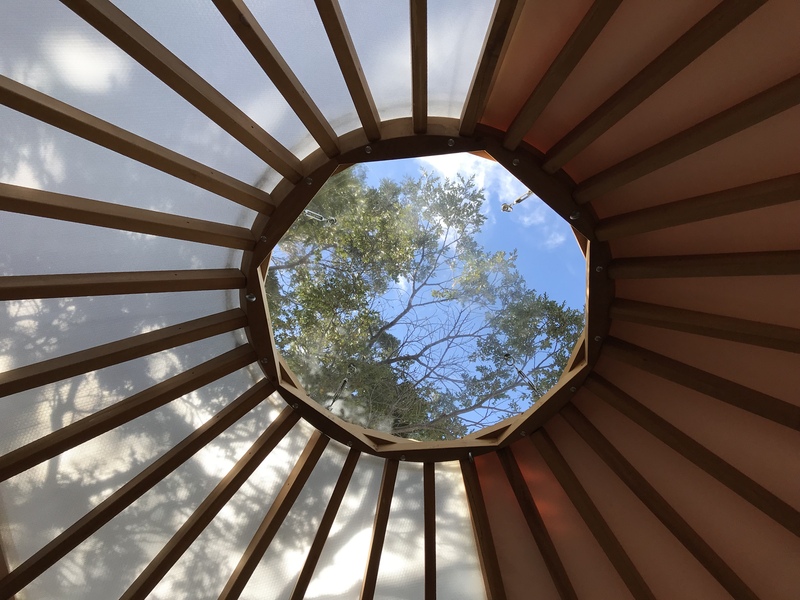 Positive that our yurt would be wrenched out of the grown and swept away, I plotted an escape plan as I lay in bed, just so we were prepared in case disaster struck. A bit paranoid? Maybe. But I had absolutely nothing to fear. The yurt was remarkably stable. Here’s a little peek from the inside! And this was what we saw when we lay down. Don’t worry, that opening is covered with glass. Here is one of the beautiful common areas of the lodge. Check out those swinging chairs and cozy rug. On our very first day, we met our guides as a group. They showed us a map of the area, and went over all of the potential activities or treks we had available to us the next day. Just one important thing to note. While daily excursions are included, there has to be a minimum of two tents who want to do the same adventure. If you are the only tent, then you either join in with another tent, or you pay for a private excursion. That was a bit of a surprise, but now at least we know. We opted to go private the whole week because we enjoy the privacy, going at our own pace, and photographing when and where we really want to without inconveniencing others. The downside to this is you are not interacting with other guests as much as you could were you joining them. But there is still interaction during meal times and in the evening, if you desire it. For us, it was great to have the privacy during the day, but the interaction and exchange of experiences with other trekkers in the evening. People came from all over the world to be there, as well…so that added a whole new dimension of fun and adventure to our stay. Below is the dining area along with a small bar with the best views. Breakfast is typically a buffet, while lunch and dinner are sit down meals with a set menu and 1-3 choices per course. Since we’re talking about food…at Patagonia Camp, you have a two meal choices, the Bed & Breakfast or the All-Inclusive. We went with the all-inclusive, which not only included meals, but also an open bar, and daily excursions, which the guides have just gone over (see above). First, here are shots of a few entrees we enjoyed. And a few more unique drinks in addition to all of the regular drinks. First is our welcome drink, the Calafate Pisco Sour – a twist on the more traditional Chilean Pisco Sour we introduced you to in Santiago. If you remember, the Calafate is a red berry, very similar to our blueberries and delicious! Instead of waiting in a long line to check in, we were asked to take a seat and handed these delicious treats. 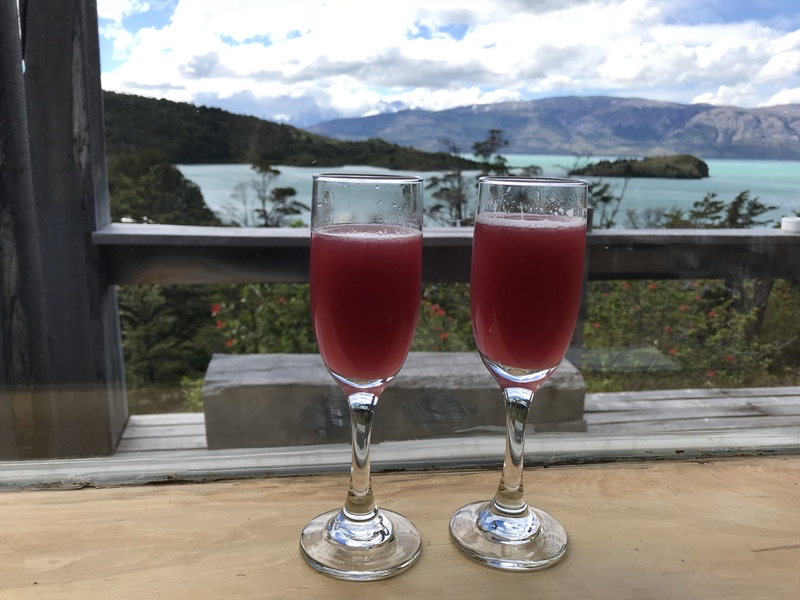 Great way to start our six-day stay at Patagonia Camp! Next was the Yerba Mate, an extremely strong tea packed with caffeine (I’m guessing more than coffee!) but with additional health benefits . I had been introduced to this years ago by my best friend from college when she returned from South America. I was a bit unsure of the tea at the time, but was determined to try it again. Pictured below is the mate cup that you use to infuse your tea, along with a metal straw that you sip from. I’m sorry to say I still did not care for it. Apologies to both my new Chilean and Argentinian friends, who tend to sip on this drink all day long, but I truly did try. That said, I’ve heard it can be served with milk and honey, so maybe one day? While all of the above is just wonderful, possibly the very best thing about Patagonia Camp is the staff. Every single staff member was lovely to interact with and went above and beyond to help us have a great stay. A special thanks to Mariana and Rafael (the amazing managerial team), to Cris, who helped coordinate all of the daily treks, and to Nico, one of the best guides and photographers we’ve met! Of course, there were so many others; it’s impossible to list them all. We loved our week with all of you and hope to return soon.